Lightweight, safe and easy to operate. Compact, high strength aluminium alloy housing with smooth contour design, a large flat base surface for increased stability in horizontal and vertical working positions. An overload protection system is built-in with a shearing pin in the forward lever which will shear when approximately 25% overloaded. The broken pins can be replaced without removing the load. Spare pins are located in the operating lever for RVBH08 and in the handle for RVBH16 and RVBH32. Forward and reverse lever placed in tandem, providing a slim compact design for storage and ensuring maximum power transfer. The rope clamp system is easily disengaged with a lever, allowing smooth installation of the wire rope. The Big Haul Creeper Winch comes complete with operating lever and 20m of wire rope mounted on a reel for all models. The wire rope is fitted with a safety latch hook at one end and is tapered at the other end for easy access into the unit. The Big Haul Creeper Winch has a parallel clamping system, which has a large surface contact area, providing an evenly distributed grip at a lower force that results in less rope wear. 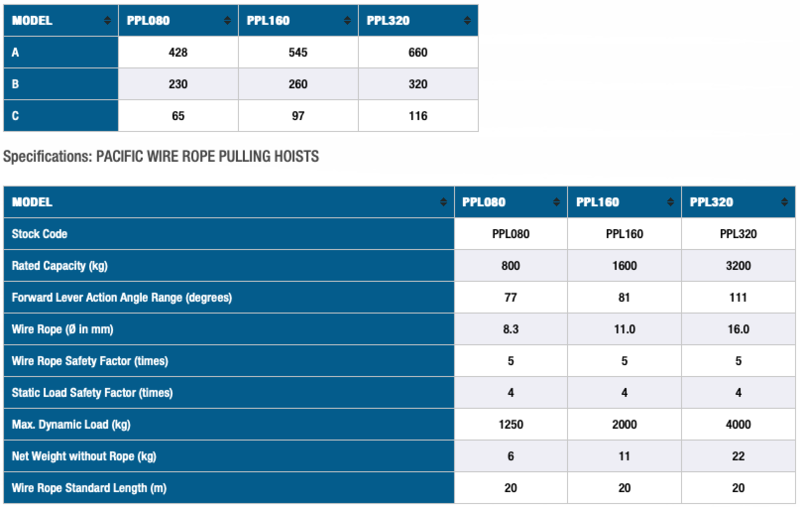 The system offers a longer rope advance and requires less handle pulling effort, thus increasing operator efficiency. All models are equipped with an anchor bolt that offers numerous connection possibilities with load hooks, wire rope and chain slings. All Big Haul Creeper Winches are tested and have individual serial numbers for easy traceability to a test certificate. Big Haul Creeper Winches are easy to maintain, service and repair.